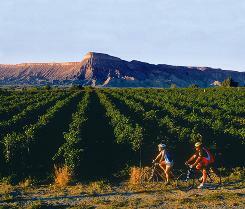 Grand Junction: Biking is a great way to tour the more than 18 vineyards outside this western Colorado town. While Napa Valley gets the most attention, winemakers are busier than ever around the nation, says blogger Jeff Siegel, who founded DrinkLocalWine.com with Dave McIntyre, wine critic for The Washington Post. Siegel says the regional wine movement, which began in the late 1970s, has blossomed, thanks to better farming techniques and a growing interest in locally sourced products. Next week marks Regional Wine Week, and the two wine experts share with Larry Bleiberg for USA TODAY some of their favorite areas for visiting and tasting. See the beautiful photos here.